July 2013 - Deb Arnold, Ink. Hawking Awards: Who Does it Well? Organizations that give out awards need to know how to market them. 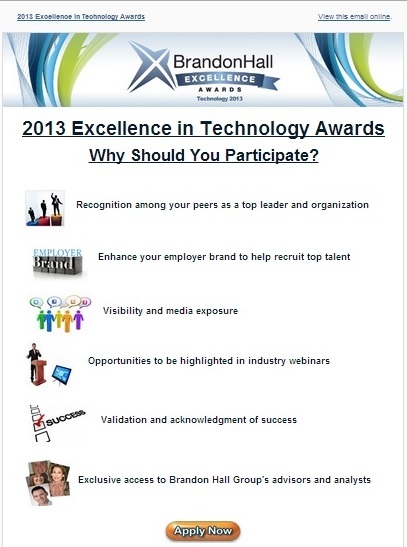 Case in point: I recently received this email from Brandon Hall promoting their upcoming 2013 Excellence in Technology Awards. Yet on their Web site, the “Why Participate” page is a dry listing of what winning companies will receive. Yes, important components, but where are the benefits mentioned in the email? Nowhere to be found.